Welcome to the SSC Recruitment 2019 page. We tried our best and gathered most precious information about the latest SSC Job Openings 2019. And shared on a single page. Those candidates who had missed the chance to apply for SSC Recruitment 2019 can now utilize this chance after checking all the trending SSC Exams Notification 2019. Get the complete list from our website. Recently, the Staff Selection Commission gives an announcement that they are ready to hire the capable and talented contenders into their organization for various posts. We suggest to the candidates get ready to apply for latest SSC Job vacancy 2019 from our website. This is the best chance for the contenders those who want to build their career in Central Government field. Here we are presenting the complete information about the Latest SSC Recruitment Notifications. Therefore, all those people, who are searching for the Staff Selection Commission Recruitment Notifications 2019 can find them here on this post. Check them all and apply, for the SSC Recruitment 2019, of which you are interested. Staff Selection Commission is frequently called as SSC. Every year a huge number of job hunters are applying for the SSC Openings before the closing dates and all the applied aspirants are participating in the recruitment rounds that is officially conducted by the Staff Selection Commission. A large number of people are dreaming of SSC Jobs. Finally, your dream comes true. Yearly the Staff Selection Commission releases the various posts such as CHSL, CGL, Lower Division Clerk (LDC), MTS, Technical Assistant, Steno, Jr Translator, Account Officer (AO), DEO, Junior Geographical Asst, Quarantine Inspector and much more Vacancies. Those who are willing to apply for the SSC Recruitment 2019 can visit this page regularly. The Staff Selection Commission (SSC) is an organization comes under Government of India to select the suitable staff for different posts in the multiple Ministries and Departments of the Government of India and in Subordinate Offices. The formation of the organization is 4 November 1975 42 years ago. Its headquarters is located at the New Delhi, India. Ashim Khurana, I.A.S. (Former Secretary, UPSC) joined as Chairman, S.S.C. on 09 December 2015 are the chairman of Staff Selection Commission. The official website of SSC is www.ssc.nic.in. We are sure that SSC Jobs gives future for their employees. Nowadays many of the candidate’s are showing they’re passionate about the Staff Selection Commission Jobs. Along with the SSC Recruitment 2019, we are also providing the Upcoming SSC Exams Notification 2019. AT present generation most of the aspirants are choosing SSC as a career option. Because the Central Government Sector provides the high salary package and job security. We all know that the Staff Selection Commission is one of the most popular reputed company. At present, it has seven Regional offices at Allahabad, Mumbai, Kolkata, Guwahati, Chennai, Bangalore. It also has two Sub- Regional offices at Raipur and Chandigarh. After announcement of SSC Recruitment 2019, all the candidates need to check the mandatory details like number of the Vacant Positions, availability of vacancies, starting date to apply for the Staff Selection Commission Recruitment Job Openings 2019 closing date to submit the filled application Form, educational qualification, Age Limit, Age Relaxation, Application Fee, Selection Process, Salary details along with the Grade Pay etc. You can find all the details in the official SSC recruitment 2019 Notification. Prepare according to the material otherwise no one cant perform well there is heavy competition for the SSC Jobs. To clear all the rounds you have to prepare well. For the sake of candidates, here in the current article we have created a table and sharing the latest SSC Openings 2019. Our main suggestion to the candidates is please refer all the details. After confirming the information proceed to the next step. Because there is a right to reject the applications by the Staff Selection Commission. So keep in mind while applying for the SSC CGL, SSC Constable, SSC GD, SSC exam 2019 notification etc. 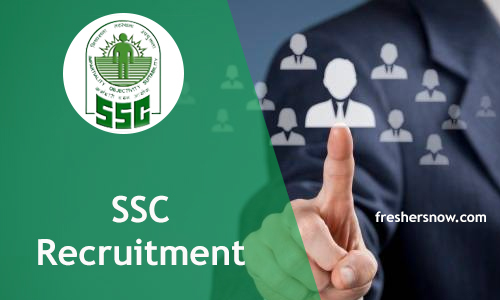 Well, SSC Recruitment 2019 is very precise opportunity for all the candidates. Don’t miss the chance this year the SSC provides many of the benefits to their employees. So bookmark this page and get the Upcoming SSC Exams Notification 2019. Keep visiting our website Freshers Jobs and get the pretty news. Before starting your application process once visit the official website or visit our website after that check the eligibility criteria if you meet with the exact details then without late apply for the Openings. To avoid last minute rush it is better to visit our site to get the staring dates as well as closing dates.